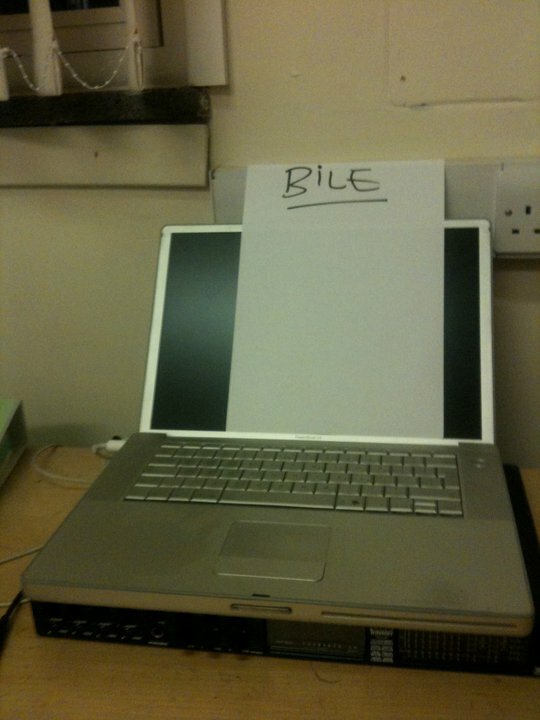 BiLE (Birmingham Laptop Ensemble) are a collaborative group of composers (instrumental and electroacoustic), performers and programmers who are all active members of BEAST (Birmingham ElectroAcoustic Sound Theatre). The core group of six artists were brought together through their shared interest in live performance and desire to perform and improvise together in an interactive ensemble. BiLE has an open attitude towards experimentation with sound, allowing members of the group to bring their own tools and musical experience to the ensemble, rather than focussing on creating a single environment for live coding and sound generation. This means that composers with varied backgrounds can contribute musically to the performance. BiLE’s core team of performers are: Julien Guillamat, Les Hutchins, Shelly Knotts, Norah Lorway, Jorge Garcia Moncada, Chris Tarren. BiLE regularly perform with glitch artist Antonio Roberts.